Durham Academy has considered issuing a digital device to students for many years. Each time, the decision was made to not move forward. At this point, Durham Academy is again investigating that a device for our students but now it is seen as more important to not only the mission of the school but also as a strategic need to remain relevant. I have been asked to present to the Middle School faculty some ideas or suggestions on how we might adjust to this change. 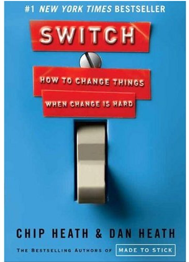 After reading the book, Switch, I thought I would try to incorporate their suggestions into this project as indeed it will be a change. In order to do this we need to prepare for the Switch to connected classrooms where the obstacle of not having access to technology is removed. What would we do differently if we did not have to go to a computer in order to use a computer? I like how she framed her challenge. This is what I will be presenting to the faculty today. In 2004 and 2007 I and others investigated deploying a digital device for our students. We were asked to do this by Durham Academy as part of our school’s strategic plan. For various reason, DA never acted on these suggestions, but did begin to use Moodle (2006) and other web-based tools. We have become known for our high-level use of Moodle and other Web 2.0 tools. A couple typical days at DA Middle School in pictures. Over the course of 2 days, I took images of what was transpiring in the computer labs and classrooms I could get to that had students. I also took some shots of lockers and other items that caught my attention. 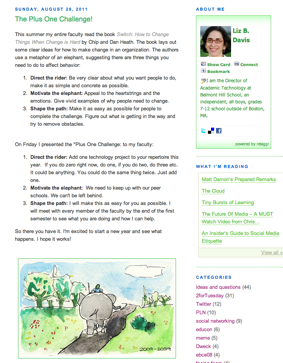 Motivate the elephant: We are being out innovated by our peer schools. Cary Academy has had tablet laptops for years. Ravenscroft is piloting Google Chromebooks with Google Apps for Education. We must change or look foolish in the comparison between peer schools. Next Month we will discuss how to Direct the Rider. ← How Did and How Does Steve Jobs Impact Us, Our Students, and Our Institution?